Wet weather once again meant low scores in the South Lincolnshire & Border League with only Claypole in Division Two topping 200. Spalding added another victory to their successful run, beating Stamford Town while Market Deeping 2nd, with two games in hand, lie second after defeating Boston 2nd by nine wickets. The other winners in this division were Long Sutton and Sleaford 2nd, now in sixth and fifth places respectively. Division One brought the closest game after Grantham 3rd had posted 160 for eight, Adam Shaw making 76. Dylan Garfoot added a half century to last week’s ton and a late 41 from Daniel Blankley took Timberland close to victory. But it was not to be as the final wicket fell just nine runs short of the target. Spalding 2nd continue to head this division despite being called off against Skegness 2nd because of a wet pitch, with Freiston in second following their win over Moulton Harrox. Abdul Moeed took six Moulton wickets to help Freiston to victory. 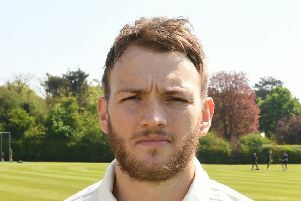 James Rickett and Shaun Brown each took five for 17 in Billingborouth 2nd’s win over Baston while Welby Cavaliers beat Heckington by four wickets. Claypole are the leaders in Divison Two, with Boston 3rd second with two games in hand. Boston were involved in the division’s tightest game, claiming victory over Grantham 4th with just one wicket still standing. Grantham made 104 and on 56 for eight, Boston looked beaten but 31 from Dan Fox steadied the ship and Steve Appleyard and Kevin Brooks saw them home. Claypole’s score of 209 owed much to James King’s 70 and 44 from John North in the middle order. Kristian Lennon then turned in the day’s best bowling performance with seven for 37 as Long Sutton 2nd were all out for 165. Mark Johnson hit 88 for Burgh & District, who overcame Belton Park 2nd while Graves Park versus Spalding 3rd was called off due to a waterlogged pitch. Results: Premier Division - Boston 2nd 132, Market Deeping 2nd 135-1 (Witt 55no); Long Sutton 181, Grantham 2nd 135; Spalding 170-5 (Newton 62), Stamford Town 78; Sleaford 2nd 189, Woodhall Spa 91; Division One - Baston 81 (Brown 5-17, Rickett 5-17), Billingborough 2nd 85-3; Heckington 73, Welby Cavaliers 74-6; Freiston 183, Moulton Harrox 96 (Moeed 6-18); Grantham 3rd 160-8 (Shaw 76), Timberland 151 (Garfoot 53); Spalding 2nd v Skegness 2nd - cancelled, waterlogged pitch; Divison Two - Burgh &amp; District 171-9 (Johnson 88), Belton Park 2nd 110-9; Grantham 4th 104, Boston 3rd 105-9; Claypole 209 (King 70), Long Sutton 2nd 165 (Lennon 7-37); Graves Park v Spalding 3rd - cancelled, waterlogged pitch.